Maybe you got your mind set on a new shower curtain as you want to make some major changes in your bathroom. Take a look at the old one and…check your curtain rod as well. It may be a small detail for many, but it’s impossible not to realize that the wrong curtain rod can definitely ruin the shower curtain. Luckily for us, the market gives us so many styles and materials for the curtain rods and you only need to give a thought on which type of shower curtain rod fits you the best. Pay attention to the style in your bathroom. Take a closer look to the wall coverings, the colors, the fixture styles, and the finishes so that you can decide which style goes better for your shower curtain rod. The style, the fabric and the pattern of your shower curtain have the big say on your rod, but this doesn’t mean you should ignore the bathmats, rugs or even the colors of your towels. When we talk about the materials of curtain rods, we see that some are strong and tough, holding the heaviest shower curtain, but you may easily find plastic or metal rods. If you want to bring a natural vibe into your bathroom, you may always go with wood shower curtains. The most versatile material is plastic though, plastic rods come in a great diversity of colors and styles, and they’re pretty unbeatable on price as well. Sure, they may not be as long lasting as the metal rods, but make a decent option for many of us out there. For the modern touch in your bathroom, don’t hesitate to give it a try with the chrome curtain rods that fit the chrome light fixtures, towel bars and faucets. If you feel your bathroom has a more of an Old World feel, go for the rods with brass finish instead. Talking about the shape of the rods is easy: you only need to think about the space in your bathroom. A rod that curves outward gives you more space, whereas a corner showers fits better an L-shaped rod. Never forget to measure the area, as you don’t want to end up with the wrong size/shape on your rod. 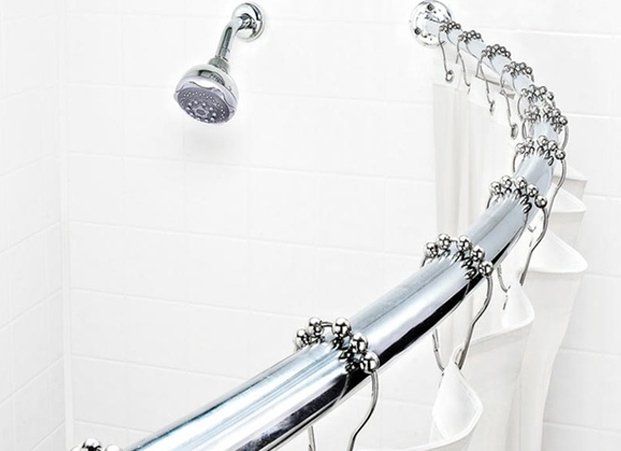 Even though most shower, curtain rods out there are adjustable, keep in mind that you can only make a large rod smaller and not the other way around. One last thing: check the wall where you’re going to hang your shower curtain. You’d need a spring or tension rod that you may twist/adheres to your tile wall- if that’s the case for your bathroom’s walls. If you’re in a hurry and don’t want too much money nor time to give a better thought on your shower curtain rod, get the sure thing that comes for a low price. 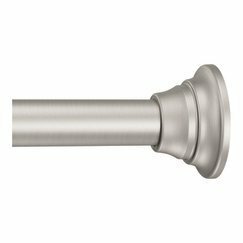 The Zenna Home 771SS Tension Bathroom Shower Curtain Rod sure fits the description and isn’t just low-priced, but also is very easy to install. The rod is adjustable so it fits all standard bathtub sizes. 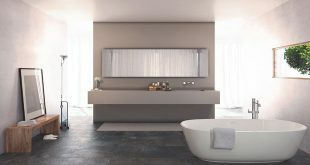 Its versatility is great, though, and the rod fits all kinds of styles and all types of bathrooms. 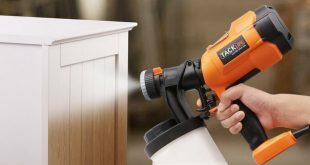 You need no tools for installing it, nor you’re going to damage or drill into the walls of your bathroom. You don’t need to be the best handyman out there either; you simply extend, twist, and …enjoy the new shower curtain rod! 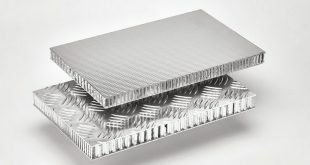 The rods are made of steel feature non-marring end caps and bring to damage in the tiles or walls. You may use standard shower rings on the rods. The curtains glide nice and easy on the rods also. The tension is right and the rods hold securely even the heavy weight curtains. The rod is pretty strong and takes a good weight, up to 30 pounds to be more precise. The cherry on top? The rods are made here at home in our USA so you know they’re good for quite some time. No matter the downsides, for the little money you pay, the rod may serve you well for a good time, no matter the style of your bathroom. 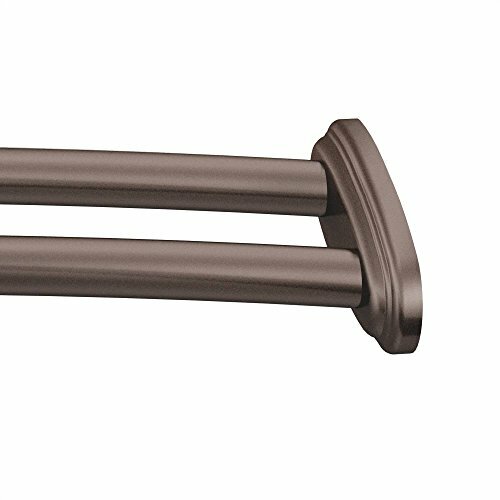 In order to understand the popularity of the InterDesign Forma – Constant Tension Curtain Rod for Bathroom, you need to take a quick look at its description. The rod brings to the table many good things and only few minor flaws that sure don’t make you change your mind, even if you’re the pickiest customer out there. The rod is made of stainless steel and plastic and tis brushed finish brings a nice, classy feeling to any bathroom. It’s supposed to be corrosion and rust resistant. A quick check of its size lets us see the rod is a medium size, expanding from 43 to 75 inches. 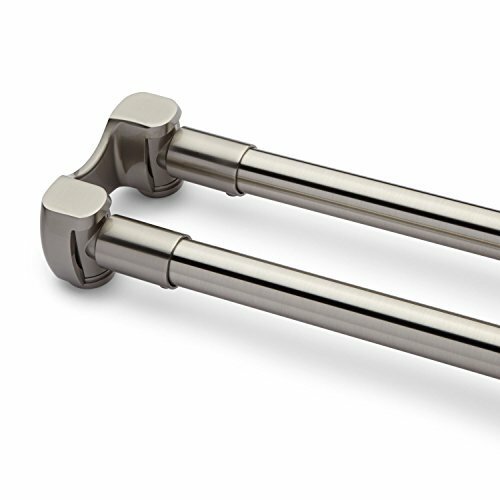 The InterDesign’s patented Constant Tension technology used on the rod gives you an adjustable rod that is versatile and functional in so many bathrooms. The rod is easy to install- you only need to extend, pull and twist. You don’t need any tools for that and it’s not a bad idea to simply follow the instructions that come along. 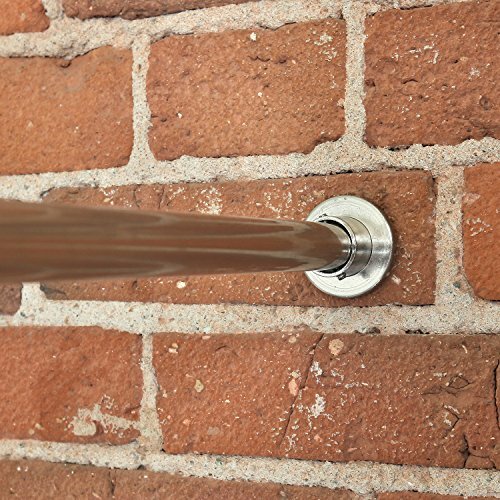 The rod doesn’t slip and is quite gentle on your walls, as it doesn’t mar or scratch them. It stays put for quite some time and ensures a sturdy hold for your curtains. The constant tension and the elimination of the wall walking make the rod a great option for many budgets out there. 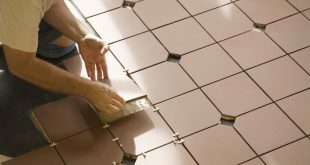 Its coated non-slip feet are efficient and protect your walls. The rod looks nice and it’s easy to clean. The built is good and the middle seam doesn’t catch on your shower rings. The versatility of the rod is good and you may also get creative and use it in a dressing as well. No matter the minor cons, the rod is still a good, reliable option that gives a good hold of your shower curtains, in a classic way. Versatile and dependable in many situations, the Moen TR1000BN Tension Rod is a sure thing when you want to make a few changes in your bathroom. The rod features the new Moen “FastLock” installation system, meaning the rod isn’t just easy to install, but also stays put. The setup is simple and you don’t need any tools to do it. You simply expand the rod out to the length you need and twist it for locking. The rod sticks and holds pretty well and looks nice. The rod fits 44-inch to 72-inch tub surround and features some pretty decorative covers that not only look nice, but also conceal the mounting contacts giving a neat, seamless look. The rod comes in three finishes (chrome, old world bronze, and brushes nickel) and you can decide for yourself, which finish fits, better your bathroom. Each one of the finishes is corrosion-resistant. The adjustability of the rod is functional and the rod is well made. The tensioning action works fine and the rod remains in place. Looking good and doing its job in the bathroom, the rod is worth to try when in need. Nevertheless, the rod is a good option that holds your shower curtain just fine, no matter the style you want to go with. 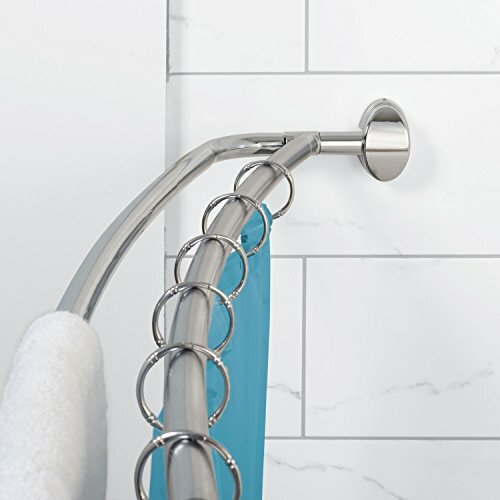 Made of lightweight aluminum, the Zenna Home 35633SSP, NeverRust Aluminum Tension Curved Shower Curtain Rod is a reliable choice, especially if you don’t want to worry about the rod getting rusted. The rod is rustproof so it’s guaranteed for life against rust. It’s very easy to install and you only need to follow the user-friendly instructions. You don’t need any tools and you don’t have to drill or damage your bathroom’s walls. The rod fits the standard tubs up to 72 inches and gives a nice appearance to your bathroom curtains. The curved design gives you up to 6.5 inches of more elbowroom and some more shower space. It does its job and it’s not only giving you more space, but also holds your curtains in place. For best results, it’s better to combine the rods with the NeverRust shower hooks and rings so that your bathroom becomes entirely rustproof. The telescoping design is versatile and fits in spaces no smaller than 50 inches. The rod stays in place and gives a good hold to your shower curtains. It looks nice and is very well made. The cons aren’t deal breakers for us and, for the little money you pay, the rods are a good curved option when in need. You may feel you need to pay the extra effort for installing the Moen DN2141OWB Adjustable Double Curved Shower Rod, Old World Bronze, but you only need to take a look at your bathroom to realize it was all worth it. Its old world bronze finish gives an artistic, antiqued look to your bathroom. 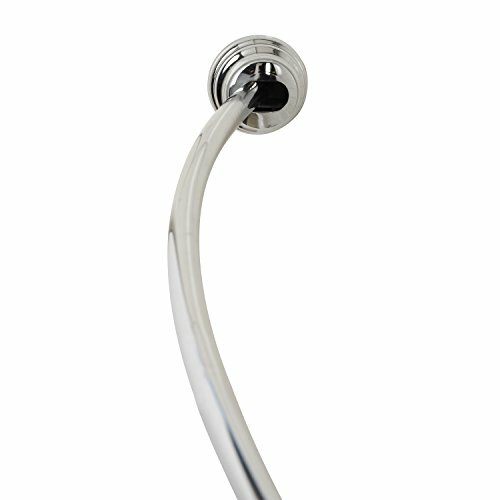 The curved double shower rod not only gives you some extra space in the shower, but also gives an elegant vibe as well. The rod adjusts to fit 5-foot tub surrounds and its design helps you separate the shower curtain from the liner. The decorative covers are functional and let you conceal the mounting hardware for a seamless appearance. They also improve the style, so they’re not only functional. The rod presents impressive stability and toughness, that doesn’t quite matches its sleek design. The shower rings slide smoothly and the risk for snags and hitches is minimal. The rod is well made and has a durability feel to it. The material is high quality and the rod works great. Despite the minor issues, the rods are still a great, elegant choice for anyone looking to increase the space in their bathroom. 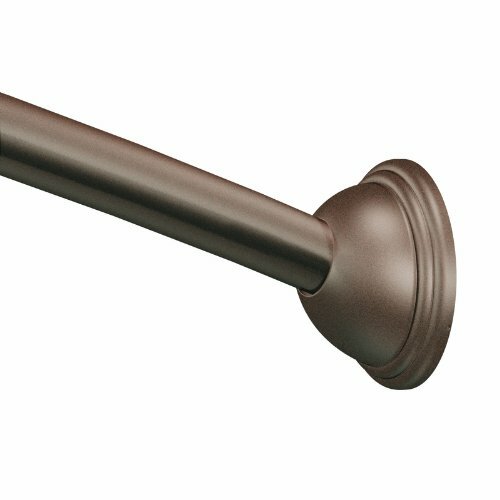 The adjustable Moen CSR2160OWB Adjustable Curved Shower Rod, Old World Bronze may require some effort from you, but it’s stable and tough on your tiles, without falling down after a while. 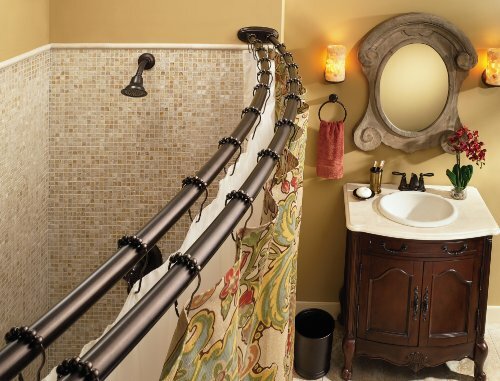 The curved shower rod adjusts to fit 5 to 6-foot tub surrounds and add nice style to most bathrooms out there. The old world bronze finish gives a nice, antique look in your bathroom. The 180-degree pivoting mounting flanges ensure easy installation. The rod stays in place and takes good weight, even the heavy shower curtains. The decorative covers of the rod conceal the mounting hardware and increase the elegant, seamless look. The rod comes in three finishes, each one of them corrosion-resistant: chrome, brushed nickel and old world bronze. It is well made and presents amazing finish. It’s easy to install and you only need to stick to the instructions. All in all, when you want a sturdy, strong and nice looking rod for your tiled bathroom, this one is a sure buy. You may find the RoomDividersNow Silver Tension Curtain Rod a bit pricey, but the more you read about it, the more you understand its value. The versatility of the rod is quite impressive and you may use it not only for your bathroom, but also as a room divider or to hang drapes, sheers, valances and even clothes. It’s a great option to use for hide some closet space and storage which explains the popularity. The heavy-duty tension rods are one of the largest options out there (80in to 120in) and fit so many types of room and windows. You don’t need any tools for installing them and you simply use the spring-loaded tension between walls. The clear rubber end grips give a strong hold and the rods don’t move. These rods come in 4 nice colors (black, white, gold, and silver) and are made with strong tube steel. The end caps have a 1.5 inches diameter. The tension is solid and the rods extend very long. 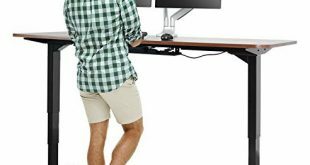 They are long lasting and are very stable considering their length. The instructions are easy to follow and the rods are easy to install. As for the rusting, you shouldn’t worry either; the rods don’t rust that fast. All things considered, the rods still stand as a versatile, dependable and long lasting option for many situations, not only for your bathroom curtains. The aluminum construction of the Zenna Home E35604SS, NeverRust Aluminum Double Curved Shower Curtain Rod doesn’t just mean the rod isn’t going to rust, but also that is strong and holds up pretty well. The rustproof rod is in fact guaranteed for life against rust so you don’t need to worry on rust. You may use the second rod to hang some towels or to create a delimitation between the decorative curtain and the shower liner. The rod fits tubs up to 72 inches and gives up to 12.5inches of addition elbow room. It gives your bathroom a spacious feel and an elegant appearance as well. The telescoping design fits in spaces even 45 inches small and install in 60 inch or 72 inch tubs. You may securely screw-mount the rods with the brackets to your bathroom wall. The brackets cover the rods, giving them an elegant feel. The rods are also lightweight and aren’t difficult to install. 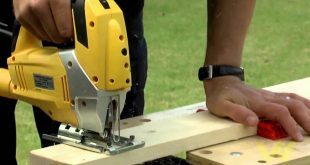 You may easily use the included screws and anchors when you go for a drywall mounting. The rods fit all standard shower curtains and are quite versatile. The instructions that come along are easy to follow and some may need a friend for installation. The rods are nice and give a sturdy hold. 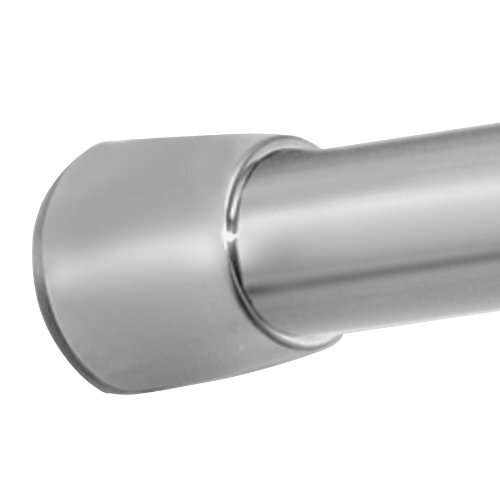 The aluminum is high quality and the rods may outlast your bathroom. Modern looking and giving a strong hold, the rods are a sure thing even for the tiled showers. Apart from the minor issues, the rods do stand out with their durability, versatility and quality. 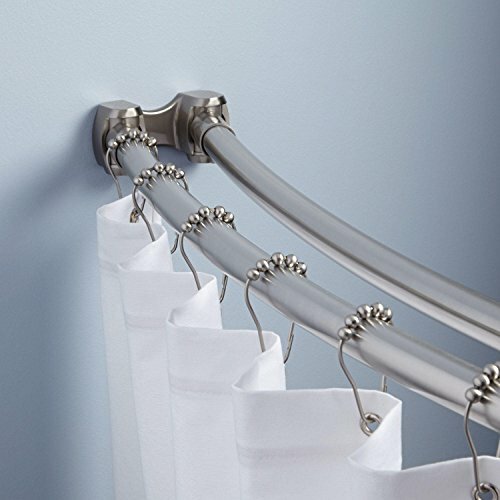 The more you pay, the more you get and the Naiture 66″Stainless Steel Curved Double Shower Curtain Rod Brushed Nickel Finish sure brings to the table a lot more than impressive looks and a high price. 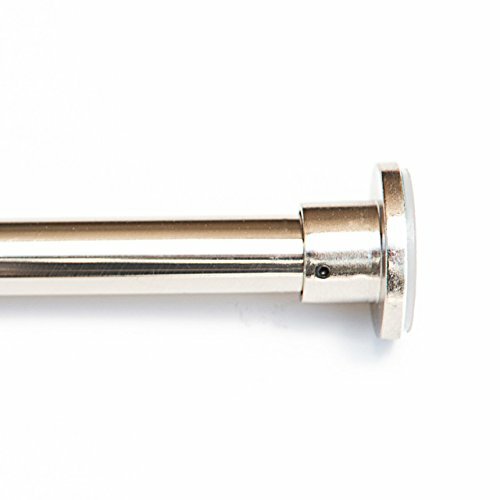 The rod is made with stainless steel and brings an elegant vibe to any bathroom. It comes in several sizes and it’s easy to find the perfect finish for you. You may choose from a nice variety of finishes: oil rubbed bronze, brushed nickel, polished brass, chrome, and white. The rod comes with its own hardware for mounting and you may need a professional hand for the best results. 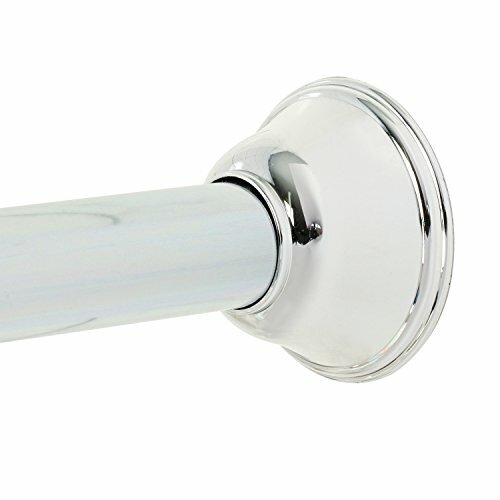 You also get Shower Curtain Rod Swivel Flanges and the materials for installation. If none of the standard sizes fits you, you can always cut the rod in order to get the length you need. The rods have a 2-3/4” space between them and you may use them separately. The rods are measured by wall-to-wall length and remain sturdy in place once they are installed. They don’t move and you may also use them on tiles. They add a nice amount of curve space to your bathroom and help the curtain slide smoothly. The rods are very well made and never rust. In order to get the best fit, your shower curtains should be 6-12” wider than the shower rods. Apart from the minor issues, the rods don’t disappoint and may the final touch that your bathroom was missing.